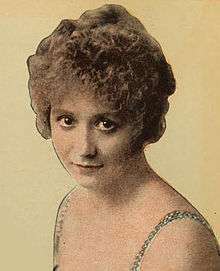 Bessie Barriscale (September 30, 1884 – June 30, 1965) was an American silent-film and stage actress, and a major star for producer Thomas Ince in the late 1910s. Barriscale was born Elizabeth Barry Scale, in Hoboken, New Jersey to Irish immigrants from County Cork. Her cousins were actresses Edith and Mabel Taliaferro. In the first decade of the 20th century Barriscale worked in the legitimate theater on Broadway and on the road as movies were not popular for stage actors yet. She began her film career in 1913, and worked intensively for New York Motion Picture Company and Triangle Film Corporation (among other studios) until she announced her retirement in the early 1930s. In 1918, Barriscale was contracted by J.L. Frothingham of B.B. Features and the Roberson Cole Company to make sixteen films. B.B. Features was an Arizona corporation. The movies were to be completed, produced, and delivered by January 21, 1921. At this time Miss Barriscale's managers insured her life for a half million dollars against eventualities. The total cost of the features totaled more than $1,000,000. Barriscale was enthusiastic about William Shakespeare and wanted to bring one of his plays to the screen. The actress was also an excellent swimmer. In The Woman Michael Married (1919) she was featured in a movie adapted from a novel by Annette Kellerman. Barriscale went so far as to hire a swimming and diving instructor and took lessons in Venice, California. A ninety-pool was constructed at Brunton Studios where the scenes were shot. The film was directed by Henry Kolker. In 1921, Barriscale came east to play in The Skirt. The play was to travel to Philadelphia and Boston after opening in Washington, D.C.. Later the production would appear in New York City. 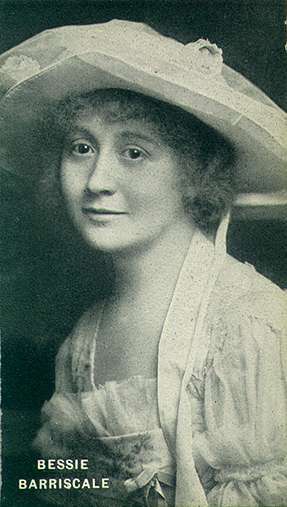 In prior years Barriscale participated in plays for the Belasco Theater in Los Angeles and once appeared in Belasco productions, notably Bird of Paradise written by Richard Walton Tully. She played a princess named Luana. 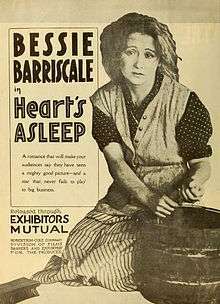 During the early years, Barriscale was in vaudeville, with two-a-day, three-a-day, and even four-a-day performances not uncommon. Actor Jackie Coogan purchased the home of Bessie Barriscale in Pellisier Square, Los Angeles in February 1922. The residence was valued at $45,000. Barriscale returned to the stage in Women Go On Forever. She had been married 21 years and had a son age twenty at this time. The production opened at the Hollywood Music Box in March 1928. She played a "housewife type," and confessed to having rehearsed for the role in a gingham dress she took from the wardrobe of her Santa Monica, California home. She said she had been working at home for several years and had just learned to cook. Barriscale died in Kentfield, California on June 30, 1965. She is buried with her husband, Howard C. Hickman, at the Mount Tamalpais Cemetery in San Rafael, California. Original caption: "Howard C. Hickman, husband and director of Bessie Barriscale, shows leading man Jack Holt how to make love to Mrs. Hickman." This appears to be a production still from Kitty Kelly, M.D. (1919). If so, the cameraman behind the Bell & Howell model 2709 is Eugene Gaudio. "Bessie Barriscale In B.B. Features." Los Angeles Times. November 10, 1918. Page III. "Flashes, New $1,000,000 Star." Los Angeles Times. December 6, 1918, Page II3. "Flashes, Star Will Travel, Bessie Barriscale Will Circle The Globe." Los Angeles Times. February 14, 1919, Page II3. "High Dive Special." Los Angeles Times. May 14, 1919, Page III4. "Flashes, Film Stars On Stage." Los Angeles Times. June 4, 1921, Page II7. "Boosting For A Bard." Los Angeles Times. September 21, 1919, Page III 1. "Bought By Film Star." Los Angeles Times. February 12, 1922, Page V2. "New Bessie Barriscale Is In Play." Los Angeles Times. March 11, 1928, Page C13. Wikimedia Commons has media related to Bessie Barriscale.